The hand and wrist can develop lumps under the skin. On very rare occasions these can be dangerous but by far the most common type of lump in the hand is a 'Ganglion' which is a harmless condition. Ganglions grow from the linings of joints and tendons, they are cysts filled with a gelatinous fluid. A ganglion usually develops on the back of the wrist or on the back of the fingers but they can occur at other sites in the hand and wrist. Adults of all ages can be affected by this condition. From time to time the ganglion may change in size or fullness, perhaps related to certain activities or movements. They can settle spontaneously but often they persist and can be painful or unsightly. Wrist ganglions are usually about 1-2cm in size and grow on the back of the wrist but they can also arise on the underside of the wrist near to the base of the thumb. In the fingers, the ganglion may be covered only by a very thin layer of skin. These are also known as ‘mucous cysts’ and typically are less than 1 cm in size. 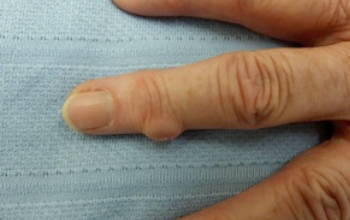 Sometimes a mucous cyst can cause a groove or a dent in the fingernail because it grows next to the root of the nail. If it bursts a colourless gel leaks out and patients can inadvertently traumatise the cyst in this way from time to time. In almost all cases these are easily removed with awake day-case (local anaesthetic) surgery and patients can return to normal activities soon after treatment. If any of your potential patients has any worries then perhaps relating my experience will help. The condition : a large painful ganglion on my right middle finger that I constantly bashed. The surgery : I lay comfortably "on my beach in the sun" whilst you worked on my finger for about 20 minutes. After the initial slight discomfort of the anaesthetic needle I couldn't feel a thing. Afterwards : as the anesthetic wore off I expected some pain but there was none. As instructed I kept the dressing on for just over a week, keeping it dry when showering by putting my hand in a plastic bag. When I removed the dressing my finger was healing nicely just looking a bit messy with dissolving stitches and old skin flaking as new skin formed. I re-covered it for protection when I did any manual work. This phase lasted perhaps another two weeks. Six weeks on: you would have to look closely at my finger to know that there was ever a problem. I use it as normal. Quite a prominent ganglion on the side of a finger. It is a harmless cyst filled with a clear gel. In many cases these settle without treatment. Ganglions can be painful or prone to being traumatised during daily activities. If the ganglion persists it can be removed with with a short local anaesthetic operation. A few weeks after surgery the surgical scar is neat and it will continue to fade; the skin and finger are supple.